Not far from the Labi Hauz Ensemble there is another symbol of Bukhara - Chor Minor. The name of this Monument is translated as "four minarets", but it will be mistake to consider it the mosque - minarets do not perform their intended functions, and are just the architectural experiment. There are no more similar buildings in Asia. Built in 1807, the building was just the entrance into the more grand construction, which supposedly was the madrassah, although there are conjectures that it was a huge library. Four minarets of small height are covered with glazed bricks, and the small dome lies between them. In fact, due to the small size it is difficult to find this monument of the XIX century. 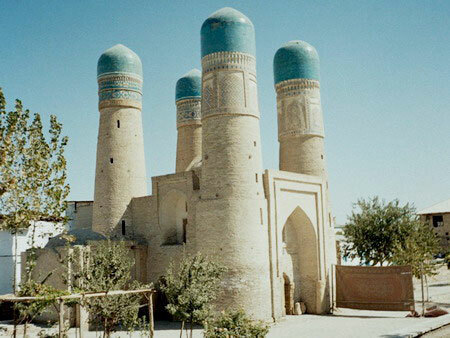 But the unusual architecture and the general proportionality of the Chor-Minor made it the favorite place of visit for many guests of Bukhara, and the experienced guide will always show you Chor-Minor, and will talk about its short but rich history.